Whether you’re a homeowner revamping your flower beds or a landscaper completely redoing a lawn, our yard waste dumpster rentals can haul away brush, shrubs, dirt and other lawn debris quickly and affordably. We have dumpsters to handle any size job and when you work with us, you’ll have an expert team on your side to keep your cleanup rolling smoothly. With Dumpsters.com, you won’t have to worry about the cleanup while creating beautiful landscaping. 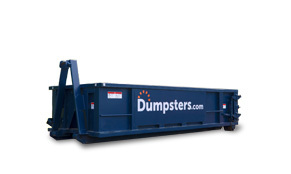 We typically recommend one of these dumpster sizes to handle yard waste pickup. But if you need to remove dirt, concrete or brick, skip down to our section for Dirt and Heavy Debris. Please note: In most areas, yard waste can’t be mixed with other debris. So please don’t toss any old patio furniture, lawn care equipment, concrete or other junk in your yard waste dumpster. If you do, there may be extra fees to cover separate disposal for those items. But don’t worry—when you call to order, we’ll let you know exactly what’s accepted in your area. While the sizes below are best for landscaping debris removal, we also stock 15 yard and 30 yard dumpsters. If you’re not sure which size is right for you, give our friendly team a call at 844-444-3867. Removing several shrubs or small trees. Clearing old mulch out of several beds. Removing a large number of shrubs or small trees. Clearing brush from a mid- to large-size area. If you’re planning a project like removing dirt to install new flower beds or tearing up an old concrete walkway, you’ll likely need one of these containers. Please note: Whether we can take dirt or heavy debris varies by location. 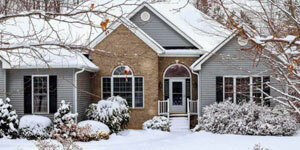 For information specific to your area, call us at 844-444-3867. Dirt must be “clean”: no contaminated soil, trash, or other debris. In some areas you may be asked to fill the dumpster only half full to stay within the weight limit. Call us for weight limits and pricing in your area. Debris must be “clean”: no rebar, mesh, trash or other objects. In some areas, there are may be restrictions on what types of heavy debris can be mixed together and how full the dumpster can be. Call us for weight limits, pricing and restrictions in your area. Why Toss Your Yard Waste With Us? When you call us, a real person will always be on the line to answer any questions and make sure you get the right service for your specific needs. 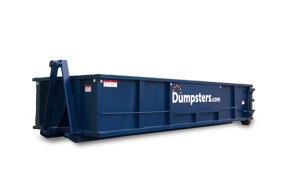 There’s a lot to consider when choosing a dumpster size but we’re here to remove the guesswork. We give all-inclusive quotes so you’ll know your true costs upfront. We accept nearly all common yard waste and if there’s anything we can’t take in your area, we’ll let you know before you order. Using machines to move dirt and debris? Our dumpsters have doors for easy loading. Whether you’re clearing land for new construction or finally cleaning up that overgrown corner of your yard, our dumpster rentals will get even the largest quantities of brush out of the way quickly so you can focus on the real work of transforming the space. Got limbs or shrubs to deal with, too? Toss them right into the dumpster alongside the brush. And if you need to get rid of dirt, we can get a special-use dirt dumpster out to you fast. With Dumpsters.com, yard waste disposal for any project is as simple as calling us up and telling us what you’re throwing out. We’ll take it from there. Not sure where to start with your landscaping project? Find the inspiration you’re looking for on our blog.